Black and white wedding invitation. A white background with black scroll print and finished with 3 white ribbon roses. This invitation comes complete with all your wedding details printed inside and envelope. Also available as a evening invitation, engagement invitation and wedding anniversary invitation. A sample is available. 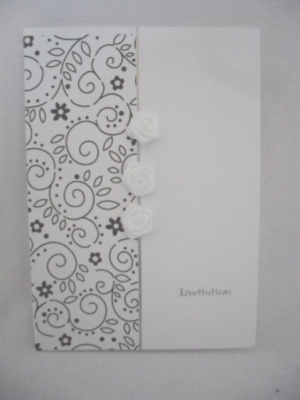 Other matching wedding stationery is also available.